Mitsubishi CP-9550DW-U System Printer - PFS / Photo Finishers Supplies Inc.
With the Mitsubishi CP-9550DW-U printer, Mitsubishi unveils innovative and performance enhancing dual line technology and an adaptive thermal head management engine to improve head resolution which results in even greater image quality, detail and texture at superior resolutions. Incorporating a unique roll-type mechanism for jam-free reliability, the Mitsubishi CP-9550DW-U printer will provide continuous high quality performance. DPS Click 5000 and DPS Kiosk 7000 photofinishing systems. Mitsubishi CP-9550DW-U printer offers unique color imaging control system for superb image quality print after print. A unique color reproduction system developed specifically for the Mitsubishi CP-9550DW-U printer delivers consistent print quality, regardless of ink sheet, for superb quality every shot. A revolutionary new system, the ink sheet rolls feature built-in Color Imaging Chips that contain specific data about the media. The Mitsubishi CP-9550DW-U printer uses this information to accurately control color characteristics. The Mitsubishi CP-9550DW-U printer features an all-new 346 dpi thermal head for longer service life and improved print quality. With optimized adaptive thermal head management engine pulse control, a key technology for dye sublimation printers, and internal 16-bit processing, the Mitsubishi CP-9550DW-U printer delivers exceptionally accurate and detailed reproduction. Super-fast printing (15 seconds for 3.5 x 5" size) is yet another breakthough. Exceptionally Fast, High Volume Printing. A new feed mechanism combined with a simplified paper path delivers photographic prints at an exceptional speed. Equipped with two 32MB memory frames. Images can be stored in memory while printing. 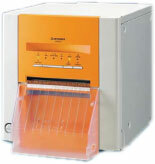 Mitsubishi CP-9550DW printer offers easy-to-use, convenient front access. The easy-access front panel of the Mitsubishi CP-9550DW-U printer simplifies paper loading and maintenance and includes a paper catch tray with a maximum recommended capacity of 20 prints. The color image control system monitors the number of prints remaining on the Mitsubishi CP-9550DW-U printer.